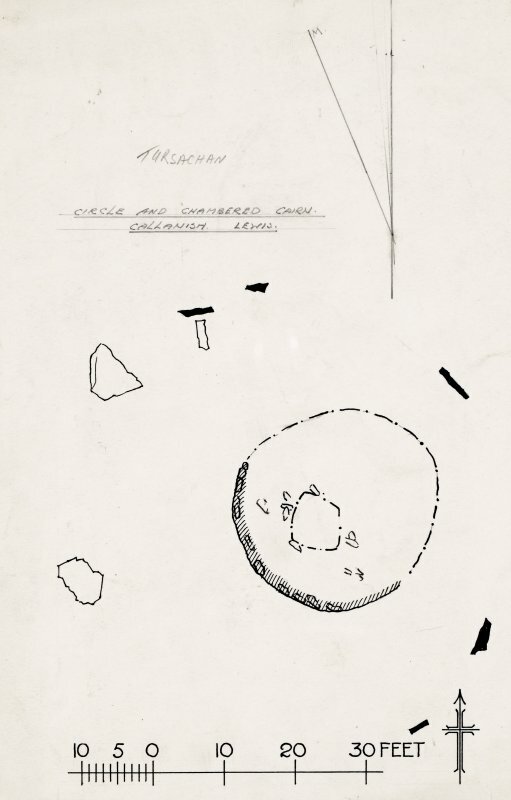 Oblique aerial view centred on the remains of the stone circles with the lazy beds adjacent, taken from the W.
Publication drawing; plan of cairn and stone circle. 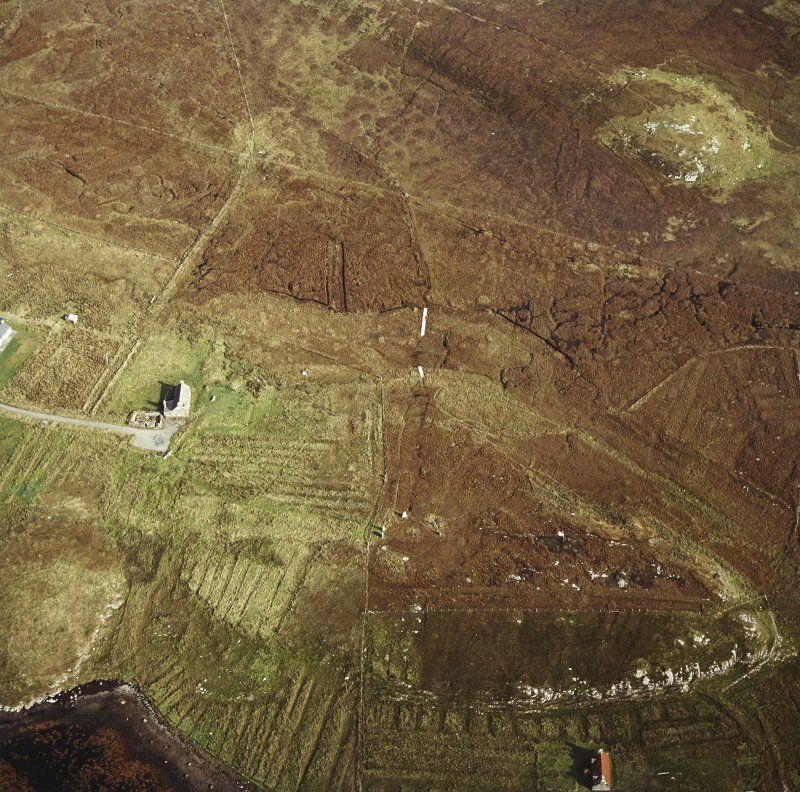 Oblique aerial view centred on the remains of the stone circles with lazy beds adjacent, taken from the E.
Oblique aerial view centred on the remains of the stone circles with lazy beds adjacent, taken from the SW.
Plane-table survey of 'Tursachan' stone circle. 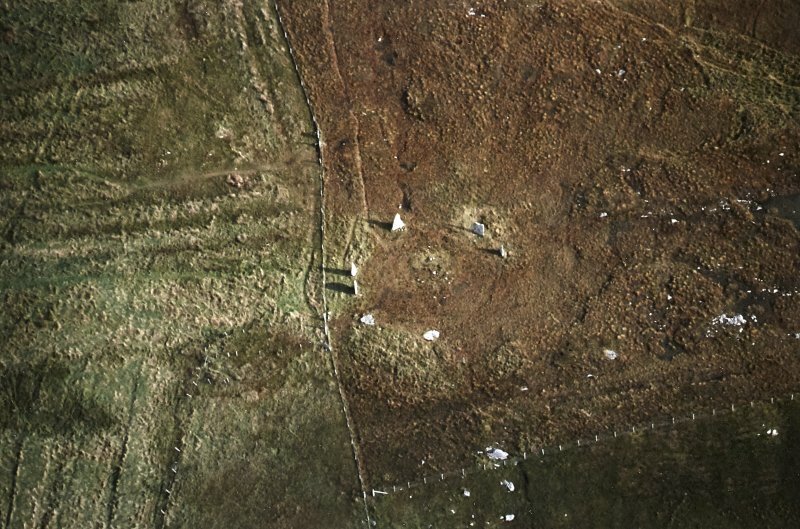 Oblique aerial view centred on the remains of the stone circles with the lazy beds adjacent, taken from the E.
Oblique aerial view centred on the remains of the stone circle with the stone circle and standing stone adjacent, taken from the ENE. 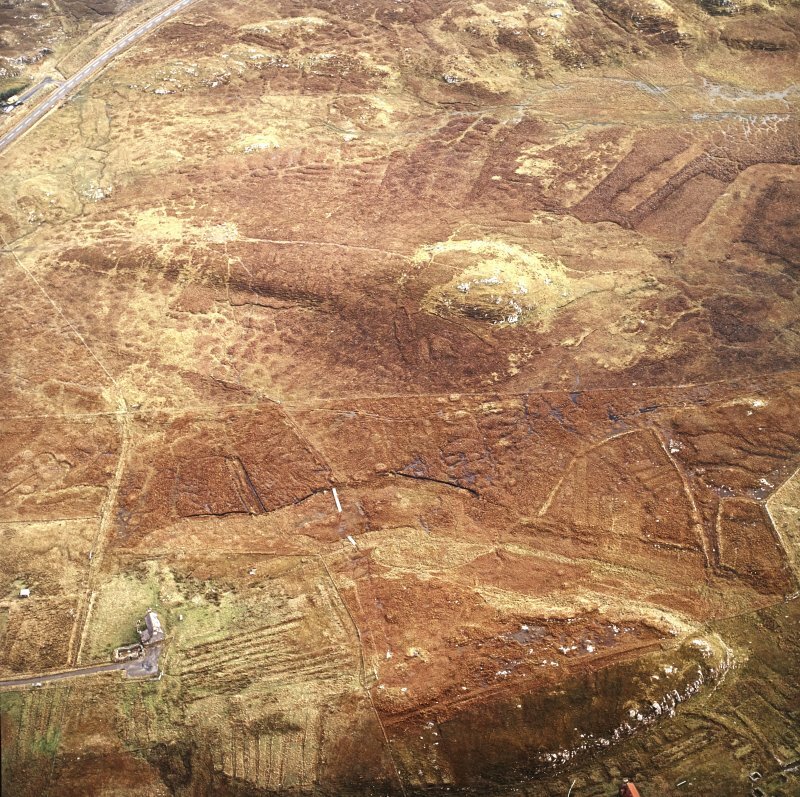 Oblique aerial view centred on the remains of the stone circle with lazy beds adjacent, taken from the WSW. 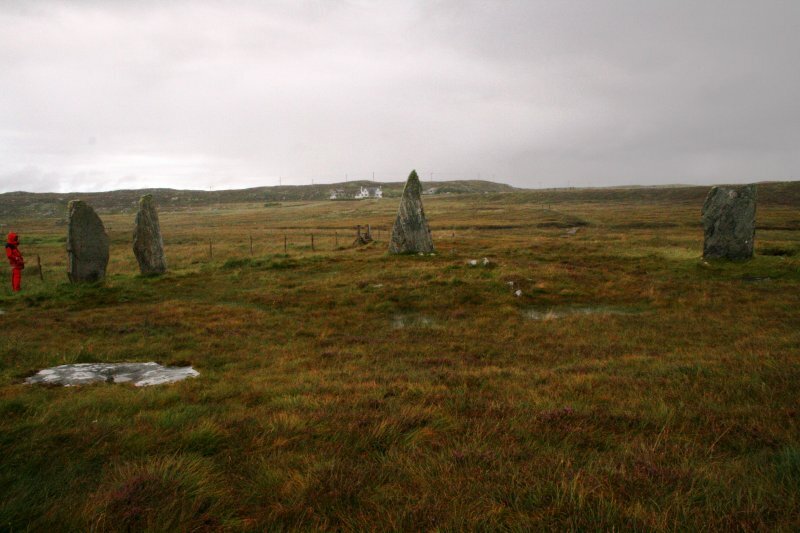 Stone Circle, 'Tursachan', near Callanish, from south-west. 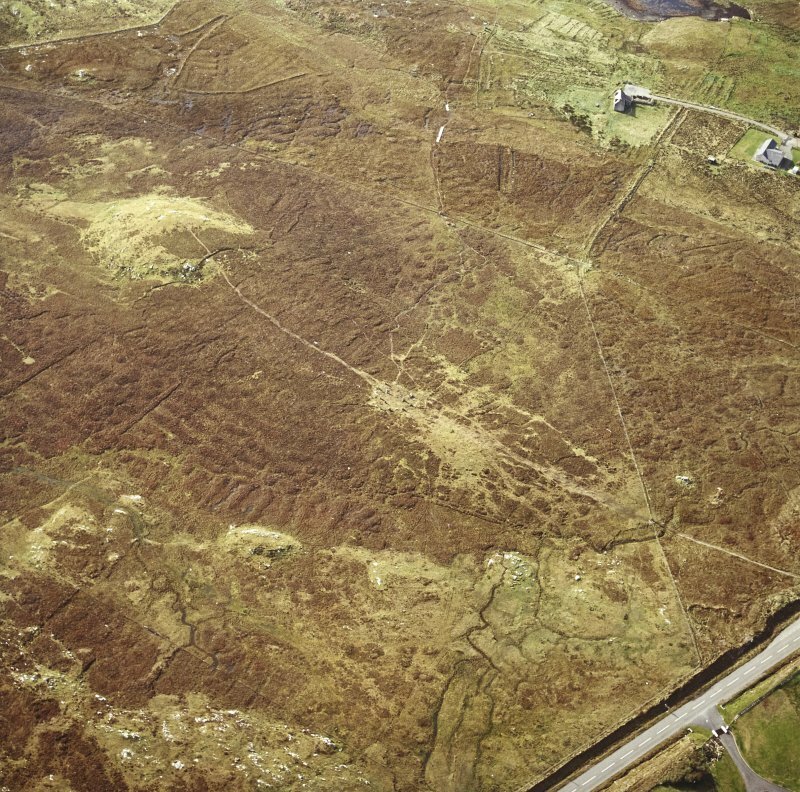 Oblique aerial view centred on the remains of the stone circle with lazy beds adjacent, taken from the SSE. 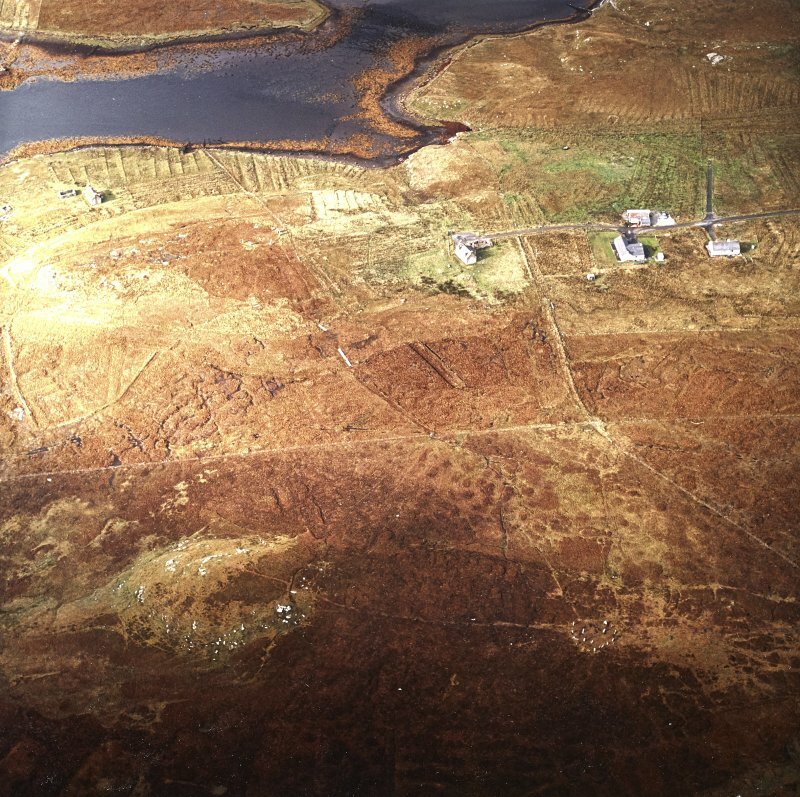 Oblique aerial view centred on the remains of the stone circle with lazy beds adjacent, taken from the W.
Oblique aerial view of 'Tursachan' stone circle, near Callanish, Lewis. 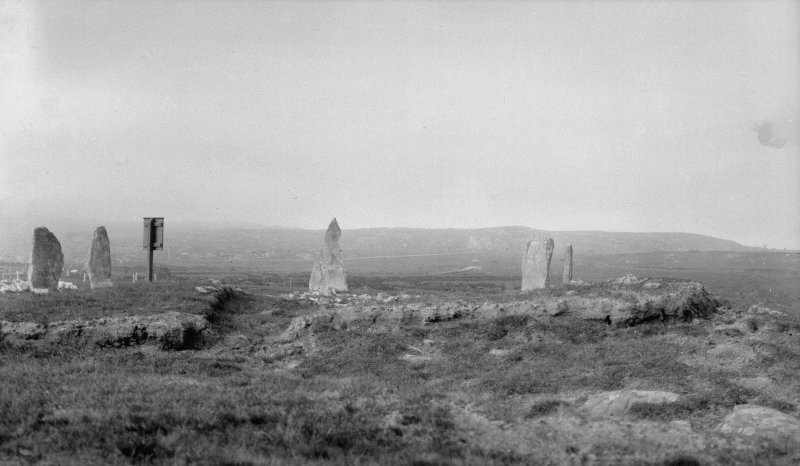 A circle of tall, thin standing stones surrounding a cairn, the original character of which cannot now be determined with certainty. 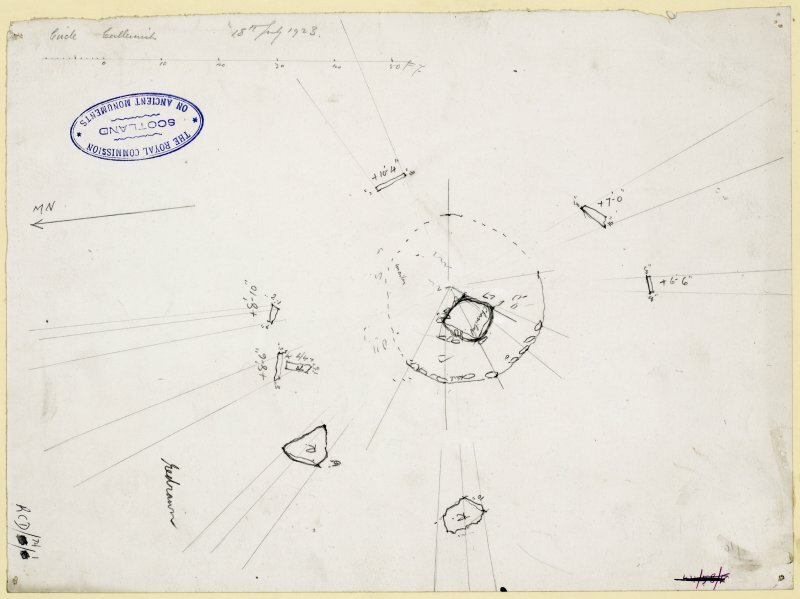 The cairn measures 28' in diameter and 1' in height and shows in its centre an excavated cavity 6' in diameter. 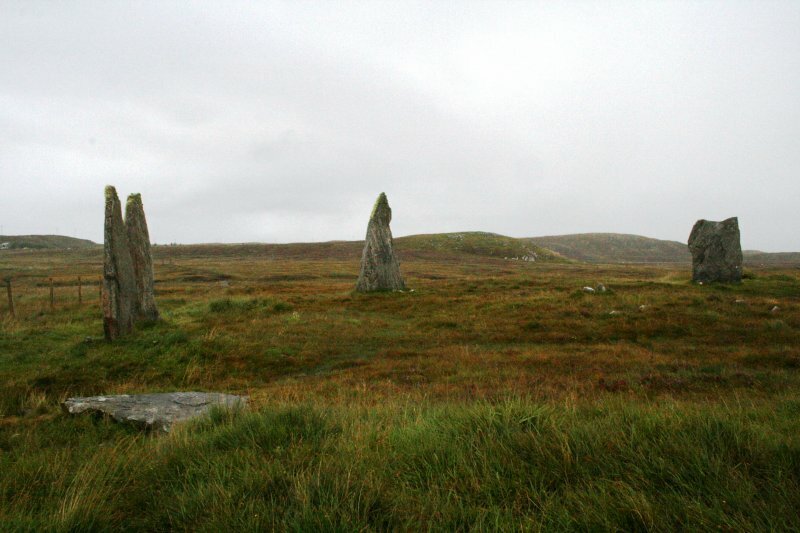 The stones, of which five are erect and two prostrate range from 10'9" to 6'6" in height. 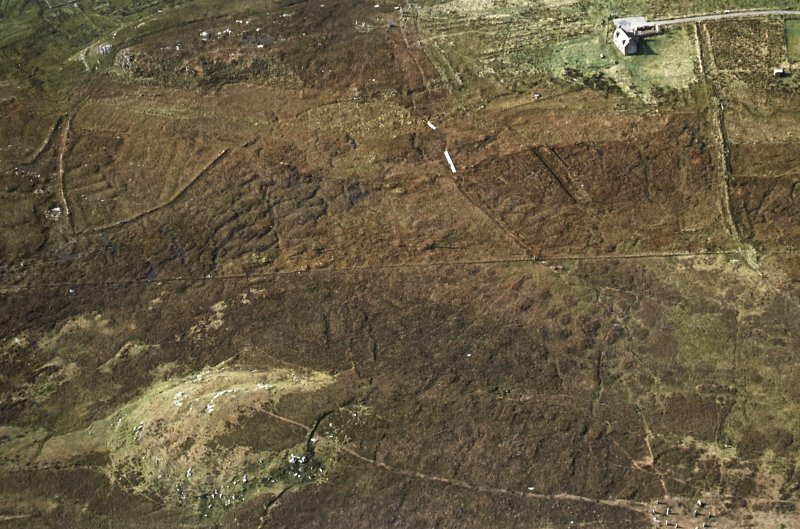 A slab 4'8" long by 1'9" in greatest breadth lies in front of the most westerly erect stone, pointing towards the centre of the circle, which is 65' in diameter. 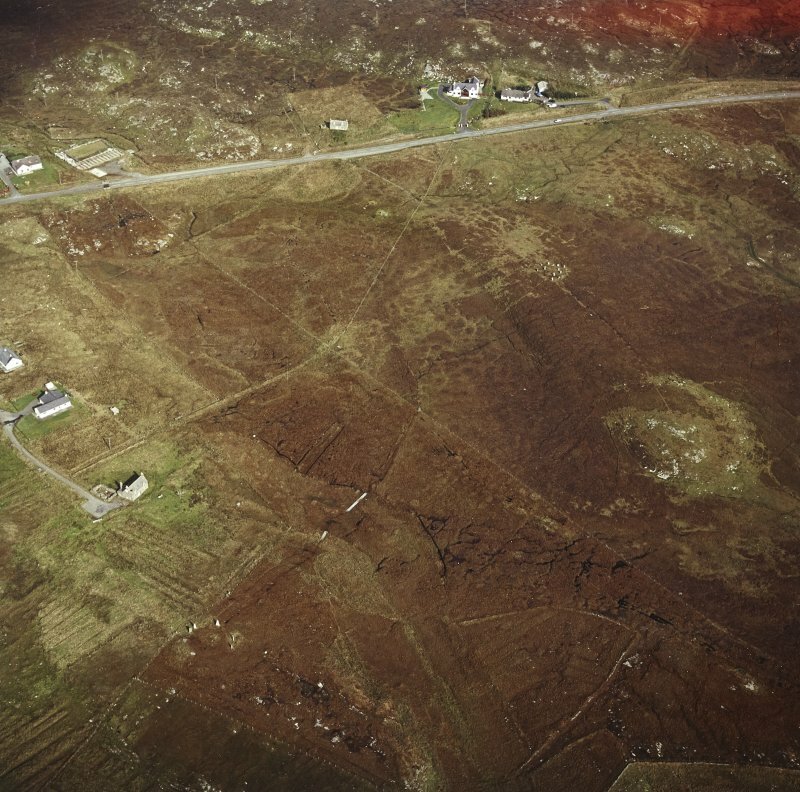 A stone circle with a cairn placed eccentrically within it, generally as described and planned by RCAHMS. The stones are on the same level as the surrounding ground, but the interior is slightly sunken. 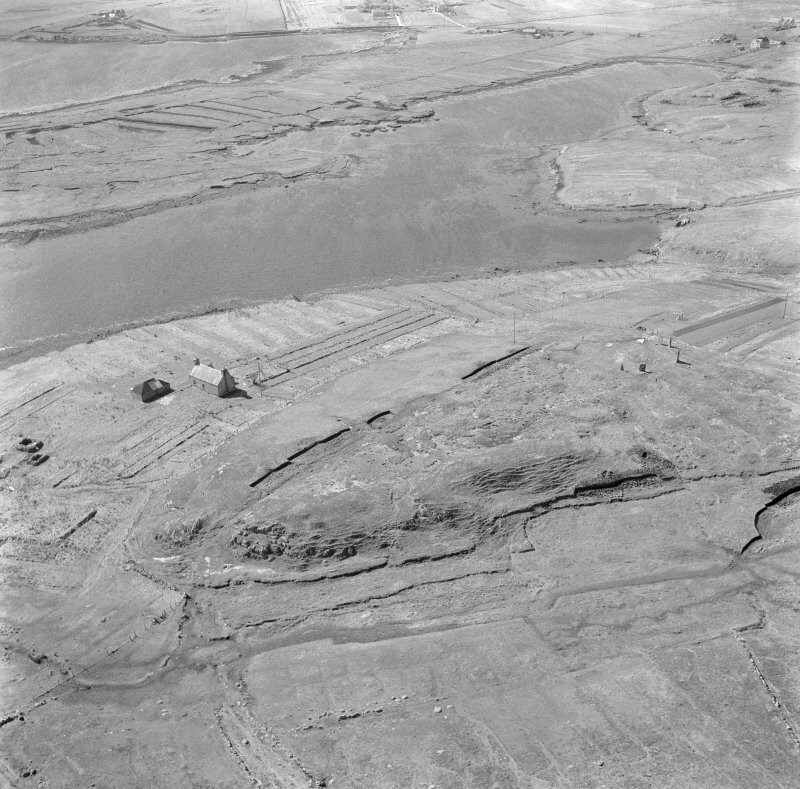 Visited by OS (R L) 20 June 1969. 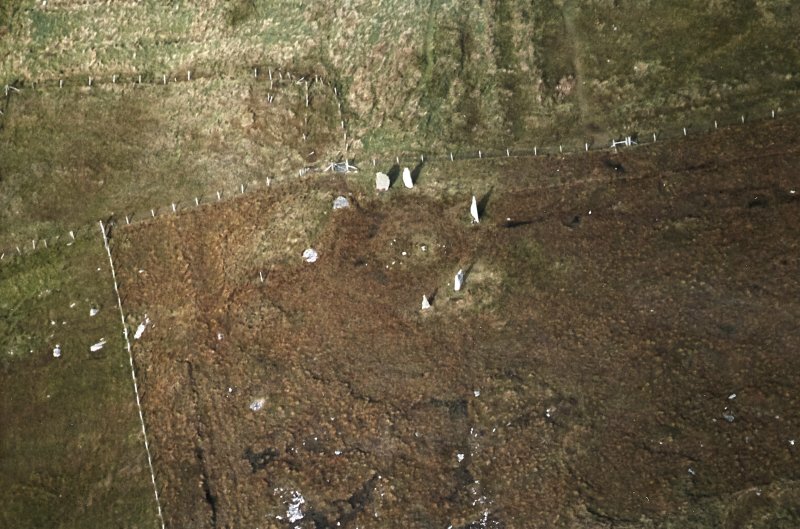 Scheduled as Ceann a'Gharaodh, stone circle and cairn. Information from Historic Scotland, scheduling document dated 2 November 1992. 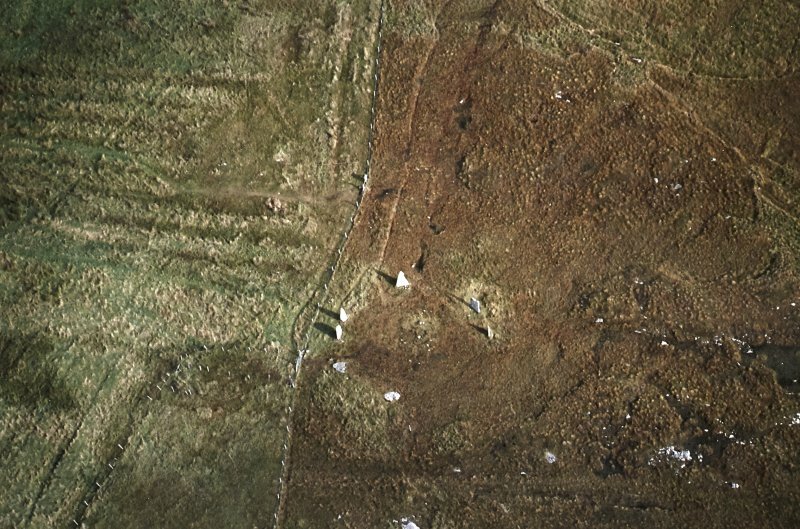 This cairn and stone circle are as described. The slightly sunken interior was water-filled on the date of visit.